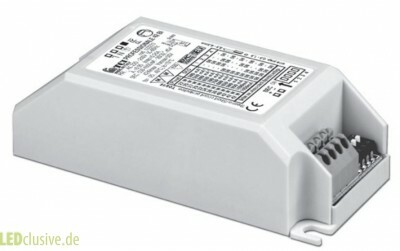 LED Driver 1A constant current or higher are suitable as operating devices for LED-COB modules. With Dip switches you are able to adjust the currents of the LED Drivers according to your wishes. We offer universal high current LED Drivers with constant current from 1A and several programming options. Most of the LED Drivers are dimmable via DALI, 1..10V, Push-Button function or trailing edge phase cutting. Price optimized multi power LED driver up to 38W with CC from 300mA to 1,05A. Flickerfree based on amplitude dimming. Affordable multipower driver with 42W power at currents from 300mA to 1.05A. TCI LED driver 50W, switchable brightness with external dusk sensor. 350, 500, 700, 900, 1050, 1400mA const. ; 48V const. LED converter 50W, dimmable via "Push-Button" or Triac 1,05 A - 2,1 const, 24 V const. DALI LED-driver for high LED currents: 1,05A - 2,1A. 48V const.